Are users complaining that your network is slow and applications do not respond fast enough? Rather than wonder what’s going on, Allot Real-Time Network Monitoring & Metrics can show you with certainty how every application and user is behaving on your network. Your organization relies on a wide array of business-critical applications to drive productivity and profitability. When datacenter and cloud applications don’t perform as expected, your business can suffer from low user satisfaction, slow adoption, and inability to operate efficiently. Moreover, with ubiquitous BYOD and Internet access in campus and branch locations, your network becomes a conduit for all kinds of traffic that may be crowding out critical apps. 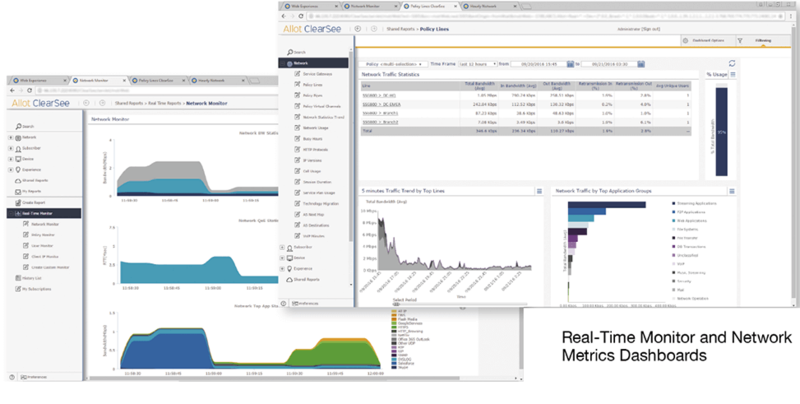 Allot’s Real-Time Network Monitoring and Metrics solution helps you classify and quantify all the activity on your network so you can take the right steps to ensure consistent and reliable performance of your most important applications. Our extensive DART signature library and practically unlimited policy elements let you monitor and measure application performance and user Quality of Experience with very fine granularity, so you can quickly zero in on network problems and troubleshoot faster. Self-refreshing performance metrics paint a real-time picture of network activity every few seconds, while interactive dashboards make it easy to peruse the data and drill down to investigate specific apps, users, endpoints, locations, and links. Help Service Providers optimize their networks and keep pace with the demand for differentiated and high quality services.